‘I announce my retirement from chess, as from 24 November 1964. In Linares on 10 March 2005 Kasparov’s declaration of retirement from professional chess was far more of a bomba, and, unlike Mr Mabbs, he will certainly receive many a tempting offer to recant his decision. For now, though, he goes down in history among those world champions whose careers ended on a sombre note, i.e. all of them. After enjoying a decade and a half of pugnacious pre-eminence, Kasparov lost a matchlet to Kramnik in Hammersmith, London in 2000 through atypically listless play, after which his supporters, and then others, took to describing him not as ‘the former world champion’ but, on account of his rating, as ‘the world’s number one player’. It was an Elo-inspired variation of the description of Capablanca on the title page of the US edition of his 1935 book A Primer of Chess: ‘World’s foremost chess expert’. In the late 1990s FIDE was favouring rapid play, knock-out tournaments, mini-champions and, more generally, whatever flew in the face of chess tradition. In the meantime, the top masters were left to their own devices. At first they indulged in tractations about a new world championship cycle, with each potential contender seeing any anticipated personal benefit as a birthright and any putative personal disadvantage as an affront. But was it all really necessary? If a direct re-match had been organized between Kramnik and Kasparov, without any qualification system, the other leading lights would, of course, have complained long and hard, yet Kasparov’s status was incomparable and anno Domini was becoming a factor. Qualifying matches were projected, announced and abandoned, but in May 2002, 18 months after the Hammersmith débâcle, the seemingly impossible was achieved in Prague with the thrashing-out and signing of a Resolution ‘on the Unification of the Chess World’. 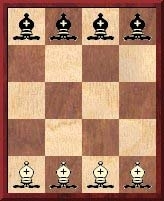 Although a compromise which fell short of Yasser Seirawan’s original proposal, it became the only realistic prospect of bringing about a match for the undisputed world championship. Throughout that process, steered by Seirawan, Kasparov conducted himself better than most and better than usual. All the signatories undertook to ‘do their utmost to achieve the unification of the Chess World’, but ‘utmost’ is an undefinable word. More qualifying matches were projected, announced and abandoned, and when the Resolution eventually wilted away into limbo Kasparov was the most aggrieved party. Some of his detractors no doubt viewed this as his come-uppance, and it could indeed be regarded as the culmination of events which he himself had set in train during the nadir of his chess career, i.e. 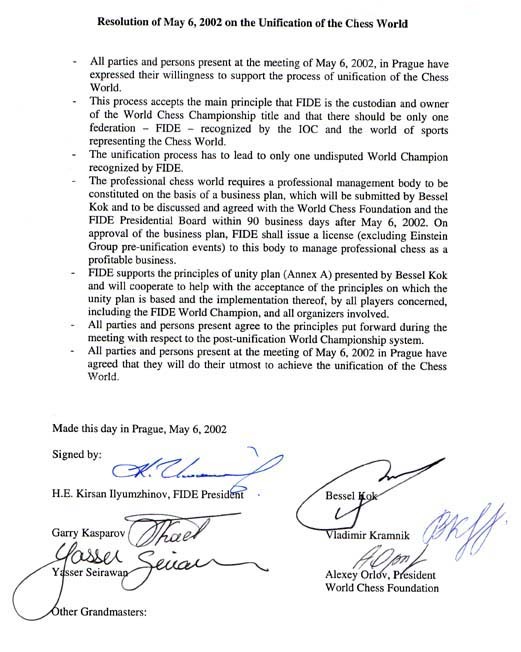 the break-away from FIDE in 1993. That episode, which has caused world championship bedlam for a dozen years, was seen as an obvious calamity by any level-headed observer at the time. To Kasparov, however, the reality did not sink in until much later: on page 13 of the 2/1999 New in Chess he described the founding of the PCA in 1993 as his biggest mistake of all. In the above-mentioned 1999 issue of New in Chess Kasparov added that he had made ‘so many mistakes’ and that ‘many things went wrong, both in business and in chess’. Such breast-beating, a rarity for a chessmaster with a jumbo ego, prompts a simple question: why has he been so prone to making so many mistakes that were so easily identifiable and avoidable? The explanation, we believe, is a fil rouge through his chess career: singularly poor personal judgment (aggravated by hot-headedness) which not only causes gaffes of all kinds but also makes him incapable of selecting an appropriate entourage to help protect him against recurrences. Nobody was there to persuade him in 1993 that his urge to abandon FIDE would occasion almost universal condemnation. Nobody convinced him in 1986-87 that publication of Child of Change was an insult to the intelligence of any reader and would, sooner or later, do untold harm to his own reputation. Nobody ensured that he steered clear of cheap literary associations with can’t-learn-won’t-learn writers. Nobody has made him see, even today, that his moribund ‘chesschamps’ website, about which he was formerly so enthusiastic, would be unworthy of a junior fan, let alone a figure of his standing. The Predecessors series is a further example of how Kasparov’s passion for truth and the highest standards at the chess board has difficulty in spreading elsewhere. Before volume two had even been published he was showing (limited) contrition over what had gone so badly wrong with volume one and how amends might be made in a revised edition. But why did he receive no proper counsel on that high-profile project before anything at all was published? Who, if anyone, gave Kasparov helpful advice over his wish to abandon professional chess is impossible to know. There will be a widespread yearning for him to resume, one day, a chess career of some kind, for it seems improper and unwarranted that lovers of the game, and not least in future generations, should be denied any brilliancies by him bearing a date later than 2005. It must be hoped that, at a moment of his own choosing and properly advised, this chess genius but deeply flawed man will revoke a retirement announcement which – in terms of his age, at least – is the equivalent of Emanuel Lasker folding up his board in 1910. We observe in passing that nobody has yet cobbled together an ‘instant’ post-retirement book on Kasparov. However, it may not be a long wait, given that his marketability has often, over the years, prompted the hastiest cobblers. In Psychoanalytic Observations on Chess and Chess Masters (New York, 1956) Reuben Fine stated (page 51) that Lasker ‘invented a kind of tank in World War I’. (In the 1967 Dover reprint, The Psychology of the Chess Player, the quote is on page 45.) What more is known about this? On page 192 of Kings, Commoners and Knaves, in an article on Juan Corzo, we mentioned Celso (‘Celsito’) Golmayo, who was the son of Celso Golmayo y Zúpide and the brother of Manuel. Celsito, it was noted, won the 1897 Cuban championship in Havana after a play-off against Andrés Clemente Vázquez. We should like to find out more about him, for it was uncommon in the nineteenth century for a teenager to become a national champion. 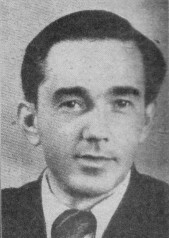 On page 183 of Ajedrez en Cuba (Havana, 1960) Carlos A. Palacio gave bare details of the tournament, stating that Enrique Ostolaza came third, Juan Corzo fourth and Manuel Golmayo fifth. A brief obituary of Cels(it)o Golmayo was published on page 97 of the April 1924 La Stratégie. 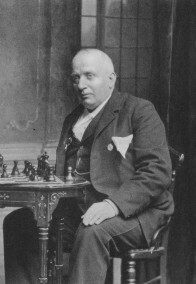 Although it stated that he had died in Seville at the age of 42, Jeremy Gaige’s Chess Personalia (which mentioned the French magazine) gave his year of birth as 1879, and this does not match up. However, another source also had 1879: ‘Celso Golmayo y de la Torriente (Habana 1879)’ was the reference on page 202 of Primer libro del ajedrecista by J. Paluzíe y Lucena (8th edition, Barcelona, 1938). 21...Nf6 22 Qxe7 Rfe8 23 Nf5 Qh5 24 g4 Nxg4 25 Qg5 Ne3+ 26 Nxe3 Qe2+ 27 Rf2 Qxe3 28 Rc3 Qd4 29 Rg3 Resigns. 17 Qe2 Rae8 18 Nxe8 Rxe8 19 Nxg7 d3 20 Nxe8 dxe2 21 Nxd6 Nf3+ 22 Kg2 e1(Q) 23 Rxe1 Nxe1+ 24 Kf1 Nf3 25 Nxc4 Resigns. 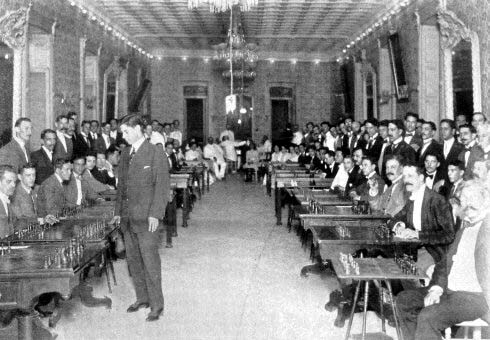 If La Stratégie is correct, Celsito could indeed have been 15 years old in 1897, but there is still a problem: Lasker’s visit to Havana was in 1893, before he became world champion. Frank Camaratta also reverts to a matter outlined in C.N. 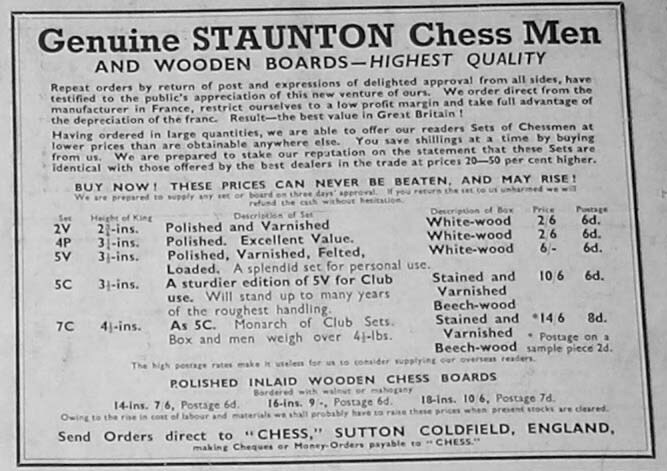 360 (see page 109 of Chess Explorations): the court action taken by John Jaques & Son, Ltd. against CHESS after the magazine’s 14 September 1937 issue featured an advertisement for ‘genuine Staunton chessmen’, whereas they had not been manufactured by Jaques. 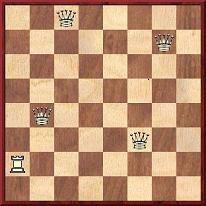 CHESS lost the suit, but won on appeal. In addition to the article by Fred Wren mentioned in C.N. 360, an account of the affair by Gareth Williams on pages 28-31 of CHESS, September 2001 may be noted. 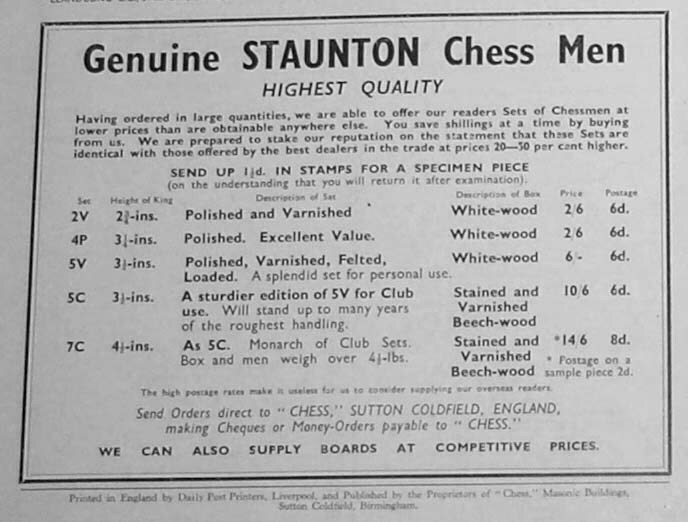 Mr Camaratta asks for a copy of the offending advertisement, as his 1937 issues of CHESS are in bound form and lack the covers (where the magazine’s advertising material appeared). Our own copies for the 1930s are also bound and coverless, but a reader will certainly be able to show us exactly what appeared in issue 25 of CHESS to provoke what the magazine later called (on page 351 of the July 1939 number) ‘the chess lawsuit of a century’. We add merely that the event entailed considerable violence and that Pindar found himself in the Central Criminal Court at the Old Bailey, London. The solutions will be provided shortly to the various Dudeney problems (C.N.s 3633 & 3644), and we shall also be reverting to the Harkness/Kotov topic (C.N. 3639), thanks to contributions/translations received. Contributors are reminded that their full name and address are required. Generous remarks about this column are, naturally, much appreciated but are always – again, naturally – edited out. This unceremonious invective contained as much truth as it did logic. In the first place, Botvinnik had won both the games against his Soviet rivals only after sharp battles, subtly outplaying his opponents. Secondly, Botvinnik’s lead did not result from just two games – two points is hardly enough to put one in the lead after 13 rounds of a tournament. Botvinnik had also beaten eight other players from various countries in Europe and America. But, as is well known, invective has no need of logic! Throughout the first 13 rounds of the tournament, this Catholic paper kept up similar commentary. However, it did not help Euwe. Although he remained hot on Botvinnik’s heels, he could not catch him. Then came the 14th round, in which I played Botvinnik. The tournament leader played the opening badly and too riskily and, having reached an inferior position, overlooked a relatively straightforward combination and lost. The Dutch were celebrating. Botvinnik is beaten! To their surprise, a compatriot had done to Botvinnik what the Western masters had been unable to do. Now Euwe had caught up with Botvinnik. We ourselves were highly interested in one question: what would the newspaper which had been screeching about a conspiracy between the Russians say now? How would they get out of the ticklish position in which they now found themselves? It would appear that the shameless know no bounds. On the following day, the newspaper reported my game with Botvinnik in detail, and placed it under the headline: “Russian defies Kremlin orders! Future fate of Kotov uncertain!”. ‘It is quite clear from the above that no admission of the sort that Harkness alleges is made; quite the contrary. Indeed, it is inconceivable that any such admission could have been made, given Kotov’s known Communist loyalties, and the heavy hand of the Soviet censor. I can only assume that Harkness himself did not understand Russian (a supposition supported by his mistranslation of the book’s title) and was merely reciting something he had been told by somebody else. It may be that, in some other context, Kotov joked about asking “forgiveness” for beating his colleagues, but to suggest that this amounts to an admission of a conspiracy is quite unjustified. We are grateful too to Claes Løfgren (Randers, Denmark), who has also provided translations from Kotov’s book, commenting to us, ‘I do not see any admission of foul play’. That conclusion is shared by Christian Sánchez (Rosario, Argentina), who has submitted extracts from the Spanish translation of Kotov’s book, Apuntes de un ajedrecista (Moscow, 1959). This appears to be another of Spassky’s historical muddlings (see also, for instance, C.N. 3425). In any case, we are aware of no ‘retired Canadian professor of mathematics’ who is capable of making authoritative or reliable statements about Alekhine. Source: CHESS, Whitsun, 1963, page 264. Bernard Levin was a British writer of the supposedly highbrow variety who, like Arthur Koestler and George Steiner before him (see C.N.s 3256 and 3266), occasionally wrote about chess, on autopilot, if a world championship match was in the news. We recently came across a piece by Levin on pages 171-174 of his anthology All Things Considered (London, 1988). Endowed with the catchpenny title ‘The mating game’, it had already somehow received space in the (London) Times, of 9 November 1987, and was the usual dollop of flash-fried offal served by writers who think that a readable overview of chess can be rustled up for the populace by cribbing tittle-tattle from books like Cockburn’s Idle Passion, Fine’s The Psychology of the Chess Player and Schonberg’s Grandmasters of Chess. When the unsubstantiated pigeon story about Lasker started circulating is difficult to say, but it was a staple feature of chapter 22 of Emanuel Lasker Biographie eines Schachweltmeisters by J. Hannak (Berlin-Frohnau, 1952) and chapter 21 of the English version, Emanuel Lasker The Life of a Chess Master (London, 1959). Since many parts of Hannak’s book read like a novelette, it may reasonably be felt that something more substantial is required before Lasker is mocked. If any outsider is to cast an eye over chess and chessplayers, how we wish that it could be a truly outstanding writer with the finest insight, such as Alan Bennett. 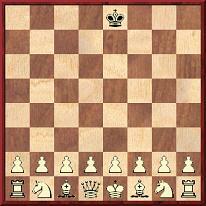 White mates moving only his bishops. 1 Bh6 Ka2 2 Bc1 Ka1 3 Bd2 Ka2 4 Bb4 Ka1 5 Bc3+ Ka2 6 Bb2 e6 7 Bc1 Ka1 8 Bd2 Ka2 9 Bb4 Ka1 10 Bc3+ Ka2 11 Bb2 exf5 12 Bxe5 Kxa3 13 Bd6+ Ka4 14 Bxf5 Ka5 15 Bc5 Ka6 16 Bc8+ Ka5 17 Bb7 Ka4 18 Bb6 Kb4 19 Ba6 Ka4 20 Bb5+ Kb4 21 Ba7 Ka5 22 Bd4 Kb4 23 Bb6 Ka3 24 Ba5 Ka2 25 Bb4 Ka1 26 Ba4 Ka2 27 Bb3+ Ka1 28 Bc3 mate. 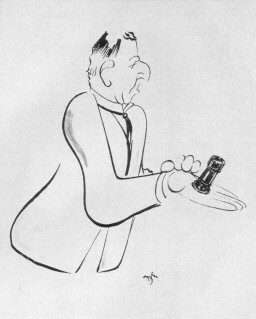 The caricature, by Zen, was of Harry Golombek, as given in III° torneo internazionale di scacchi Venezia 1949 by H. Müller (Venice, 1950). 3666. Where did they live? In the late 1990s we started compiling an ‘address book’ featuring leading chess personalities of the olden days. The list is now made available here and will be expanded from time to time. Gerhard Henschel’s 1959 book Freude am Schach was discussed in C.N. 3533 in the context of two highly dubious games claimed by him to have been played by Einstein and Stalin. On pages 93-94 of the same book Henschel gave a game purportedly won by Leo Tolstoy (1828-1910) from a royal opponent (‘gegen den Fürsten Ivkoff’): 1 e4 e5 2 d4 exd4 3 c3 dxc3 4 Bc4 cxb2 5 Bxb2 d6 6 Qb3 Qe7 7 Nc3 Nd7 8 Nf3 Nc5 9 Qc2 Be6 10 Nd5 Bxd5 11 Bxd5 Nf6 12 O-O c6 13 Bc4 Rd8 14 Rfe1 Ne6 15 e5 dxe5 16 Nxe5 g6 17 Nxf7 Qxf7 18 Rxe6+ Kd7 19 Rd1+ Kc7 20 Be5+ Bd6 21 Rexd6 Qe7 22 Rd7+ Kb6 23 Bc7+ Kc5 24 Be2+ Kb4 25 Qb3+ Kc5 26 Qc4 mate. Anyone making a check of Tolstoy games runs into instant chaos. For instance, page 413 of Şah Cartea de Aur by Constantin Ştefaniu (Bucharest, 1982) had a game which began 1 e4 e5 2 f4 exf4 3 Nf3 g5 4 Bc4 g4 5 Ne5 Qh4+ and was won by White at move 21. It was headed ‘Lev Tolstoi – E. Mood, Iasnaia Poliana, 1908’. 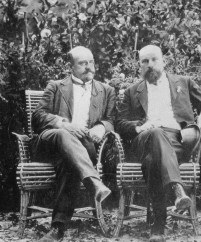 Moreover, databases have the following: S. Lebedev v L. Tolstoy, correspondence, Russia, 1900 (a game which started 1 d4 d5 2 c4 dxc4 3 Nf3 Nf6 4 e3 Bg4 5 Bxc4 e6 and was won by Black at move 39) and L. Tolstoy v A. Romashkevich, correspondence, Russia, 1901 (which opened 1 e4 e5 2 Nf3 Nc6 3 c3 d5 4 Qa4 f6 5 Bb5 Nge7 and was won by White at move 60). In each case the full score is on offer, but we dislike reproducing games from databases unless a reliable old source can be found. 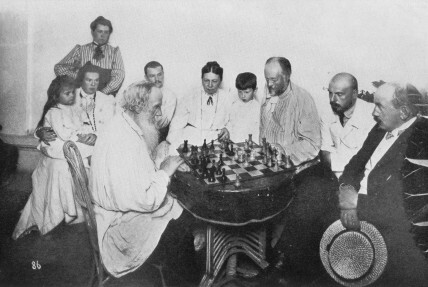 As will be shown later on, moreover, Leo Tolstoy was not the only chess-playing member of his family, and we are currently by no means sure that he played those, or any other, correspondence games. The first instance we have so far traced of a game by Tolstoy appearing in print is an article in the Rigaer Tageblatt, subsequently reproduced on pages 157-158 of the May 1907 Deutsche Schachzeitung and in a feature ‘Tolstoi als Schachspieler’ on pages 20-21 of Schachjahrbuch für 1907. II. Teil by L. Bachmann (Ansbach, 1908). 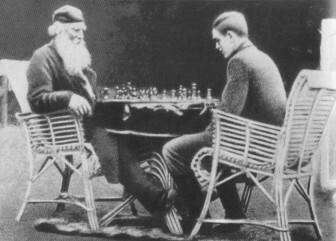 This is Tolstoy’s best-known game, against Aylmer Maude (1858-1938), who was his biographer and translator. It was stated to have been played the previous October, and the moves were given as follows: 1 e4 e5 2 f4 exf4 3 Nf3 g5 4 Bc4 g4 5 Ne5 Qh4+ 6 Kf1 d5 7 Bxd5 f3 8 gxf3 Qh3+ 9 Ke1 g3 10 d4 g2 11 Rg1 Qh4+ 12 Ke2 Nh6 13 Rxg2 c6 14 Bxh6 cxd5 15 Bxf8 Kxf8 16 Qe1 Qe7 17 Nc3 f6 18 Nxd5 Qd6 19 Qg3 Resigns. This, of course, is the game published by C. Ştefaniu with the wrong date and the wrong spelling of Black’s name. 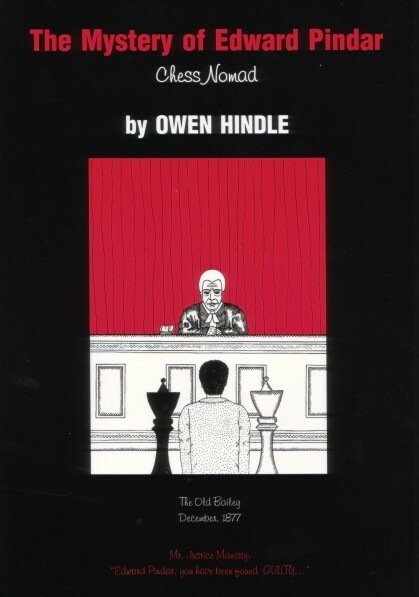 ‘Games played, as these were, rapidly, amid conversation, and when one of the players had been travelling all the preceding night, cannot have much interest as specimens of good chess. But as showing the kind of skittle game a great writer who only plays when he is too tired to work, played at the age of 78 and 81, they may be worth recording. Maude stated that the second game, in which he was White, was played in 1909 and went as follows: 1 e4 e5 2 Nf3 Nc6 3 Bb5 a6 4 Ba4 b5 5 Bb3 Nf6 6 Ng5 d5 7 exd5 Nxd5 8 Nxf7 Kxf7 9 Qf3+ Ke6 10 Nc3 Nb4 11 a3 Bb7 12 axb4 Ra7 13 Qg4+ Kd6 14 Ne4+ Kc6 15 Qe6+ Bd6 16 Bxd5+ Kb6 17 Bxb7 Rxb7 18 d3 Ka7 19 Be3+ Kb8 20 Rxa6 Re8 21 Qa2 c6 22 Ra8+ Kc7 23 Qa5+ Kd7 24 Rxd8+ ‘and wins’. Pages 166-167 of King, Queen and Knight by N. Knight and W. Guy (London, 1975) quoted from a letter dated January 1899 from Tolstoy to a friend in which he related this incident. Tourgenef condescendingly agreed, and began a game, while continuing to talk to us. The next set of quotes comes from volume two, The Life of Tolstoy Later Years (London, 1910). ‘His favourite indoor game is chess, which he plays in what seems to me the best possible way. I do not mean that he could often beat a strong club player, but that he takes his game also just as recreation, and not as a study. He spends no time on chess literature, and willingly plays in a room full of people. To make a special study of chess would be impossible for a man with so many vivid and pressing interests in life. From lack of book-knowledge, he was often weak in the openings, but was sometimes very ingenious in snatching an advantage. In fact, in chess as in all things he displayed originality and great alertness. Following Tolstoy’s death in November 1910, the American Chess Bulletin (January 1911, page 12) published ‘one of four games Count Tolstoy played in a series of games against Fritz Kuhler, a German amateur’: 1 e4 e5 2 Nf3 Nc6 3 Bc4 Bc5 4 c3 Nf6 5 d4 exd4 6 cxd4 Bb4+ 7 Nc3 Nxe4 8 O-O Nxc3 9 bxc3 Bxc3 10 Qb3 Bxa1 11 Bxf7+ Kf8 12 Bg5 Ne7 13 Re1 d5 14 Bxd5 Qd7 15 Bxe7+ Qxe7 16 Rxe7 Kxe7 17 Qe3+ Kd8 18 Qg5+ Ke8 19 Qxg7 Rf8 20 Ng5 h5 21 Nh7 Rf5 22 Nf6+ Rxf6 23 Qxf6 Bb2 24 Bf7+ Kf8 25 Bg6+ Kg8 26 Qf7+ Kh8 27 Qh7 mate. The Bulletin stated that it was ‘indebted to the Manchester Evening News for the score’, and we have yet to find a proper source, or to trace any of the three other games allegedly played between Tolstoy and Kuhler. Pages 40-41 of the February 1911 Bulletin had a feature entitled ‘The Chess Prowess of Tolstoy’ which related an anecdote or two and gave, from Bohemia, the short win by Tolstoy against Maude. It quickly became the most popular choice of a Tolstoy game for magazines to quote, also appearing on, for instance, pages 21-22 of the January 1911 issue of La Stratégie and in the Wiener Schachzeitung, August-September 1913, page 239. 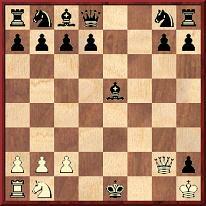 In each case it was stated that Black resigned after 19 Qg3, contrary to the version given by Maude himself. 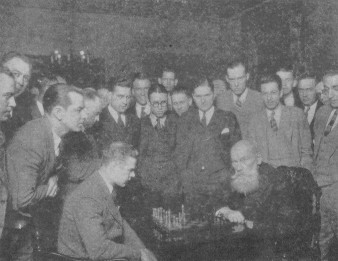 ‘Count Ilya Tolstoy, second son of the famous Russian author and novelist, played an exhibition game of chess 10 January 1929 with J.A. Anderson, city chess champion, following a lecture at the Downtown YMCA, St Louis, MO. 1 e4 e5 2 Nf3 Nc6 3 Bb5 Nf6 4 O-O Nxe4 5 d4 exd4 6 Re1 d5 7 Nxd4 Qf6 8 f3 Bc5 9 c3 O-O 10 Bxc6 bxc6 11 fxe4 Qg6 12 Be3 Bg4 13 Qc2 Rae8 14 Nd2 Bh3 15 Nf1 dxe4 16 Qf2 Bxd4 17 Bxd4 f5 18 Qg3 Bg4 19 h3 Bh5 20 Qxg6 Bxg6 21 Bxa7 f4 22 Bd4 Rf5 23 b4 Rg5 24 Kh2 Rf8 25 Nd2 e3 26 Nf3 Rgf5 27 Nh4 Rg5 28 Nxg6 Rxg6 29 Rf1 Rg5 30 a4 Rgf5 31 a5 e2 32 Rf2 f3 33 Rxf3 Rxf3 34 gxf3 Rxf3 35 Re1 Resigns. 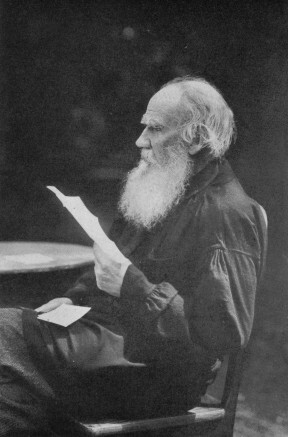 In conclusion, the main issue requiring clarification is which published games said to involve Leo Tolstoy are genuine. There seems no reason to dispute the authenticity of the three against Maude, but what of the others? Was the game against Ivkoff, given by Henschel, an invention? Were the two correspondence games played by Leo Tolstoy, or by one of his sons? 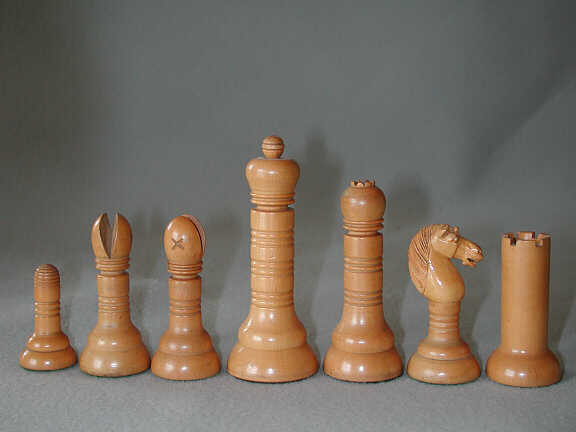 And what can be discovered about the games allegedly played by Leo Tolstoy against Fritz Kuhler? 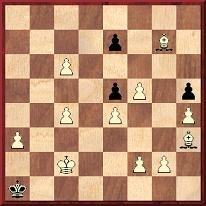 29 Re5+ ‘and mate in three’. 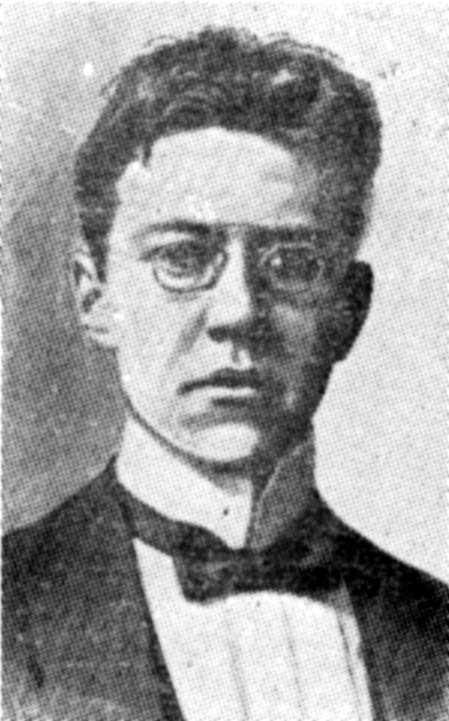 Source: Chess Weekly, 29 January 1910, page 142. Neville Heath was hanged on 16 October 1946, the same day as, in Nuremberg, Hans Frank suffered the identical fate. Even so, the Spalding lady’s delightful belief about Max Lange’s brainpower is less naive than the misapprehension of various newspaper and magazine editors that the chess columnist/correspondent on their payroll requires any time, let alone special grey matter, to fabricate his daily or weekly feature when it largely consists of bare (or barely annotated) game-scores which can be downloaded by anyone at the press of a button. C.N. 3559 indicated, on the basis of the 1900 and 1910 censuses, that Frederick D. Rosebault, Capablanca’s one-time business associate, was born in New York in July 1887, the son of Walter M. Rosebault. His mother’s forename was Sarah, and he had brothers named Leonard and Alfred. Although rock-solid proof of his demise was proving elusive, we also reported in that earlier item that a Frederick D. Rosebault who had served in Company G of the 51st Infantry Regiment, 6th Division died on 16 December 1945. Moreover, there is a World War I Draft Registration Card dated 8 June 1917 (Canton, OH) for Frederick Dana Rosebault, whose home address was given as YMCA, Canton, OH. 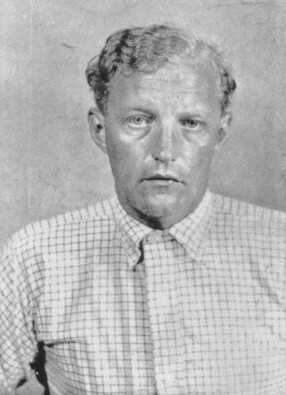 It was furthermore stated that he was born in Brooklyn, NY on 27 July 1888, and the following particulars were added: ‘Special Officer for Canton Steel Foundry Co., no children, single, tall, blue eyes, brown hair, not bald, not disabled.’ The signature on the card was: Frederick D. Rosebault. Next, our correspondent points out that the 1920 Federal Census listed, at 42 State St., East Orange, Essex Co., NJ, Walter Rosebault, his wife Sarah W. and their sons Frederick D. (aged 31, no occupation stipulated) and Alfred P. (occupation ‘US Army, Now in Europe’). Finally, Mr Miller refers to the California Death Index at http://www.ancestry.com/search/db.aspx?dbid=5180. This lists a Sarah Parker, who was married to a man named Rosebault (forename not given), and a Frederick Danar Welles, who was born on 27 July 1888 in New York and died on 16 December 1945 in Los Angeles. Our correspondent suggests that Rosebault may have changed his name to Welles. In fact, though, we can demonstrate a link between the names Rosebault and Welles. At the time Capablanca and Rosebault were in partnership, a brochure was issued by ‘Capablanca & Rosebault Chess Supplies and Literature, P.O. Box 1013, New York’. 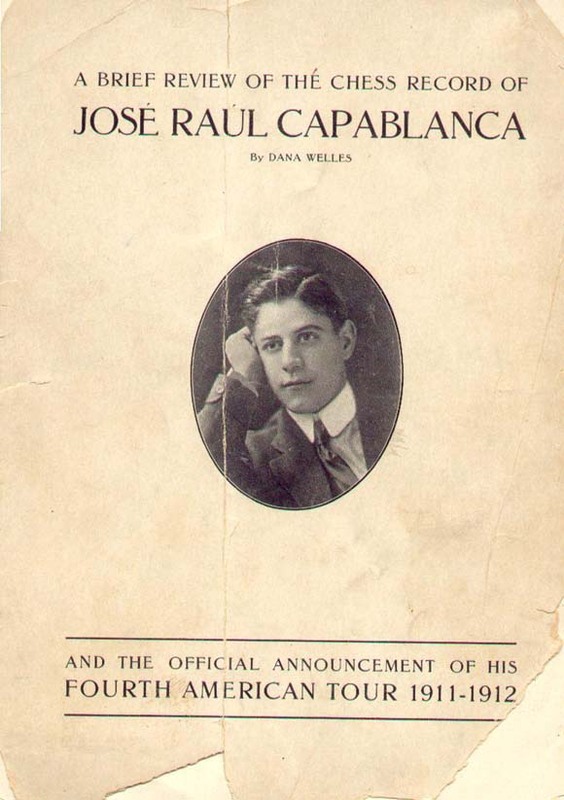 Just a few pages long, it was entitled A Brief Review of the Chess Record of José Raúl Capablanca, with the sub-heading ‘and the official announcement of his fourth American tour 1911-1912’. The author was named as Dana Welles. To summarize, the evidence currently available suggests that some time after the 1920 census Frederick Dana Rosebault changed his name to Frederick Dana Welles, having already used ‘Dana Welles’ as a pseudonym for the chess brochure which he issued jointly with Capablanca in 1911. C.N. 3574 asked whether remarks about chess being ‘too much of a game to be a science and too much of a science to be a game’ and ‘too earnest for a game; too much of a game to be earnest about’ should be ascribed to the German philosopher and biblical scholar Moses Mendelssohn (1729-1786) or to his grandson, the composer Felix Mendelssohn (1809-1847). 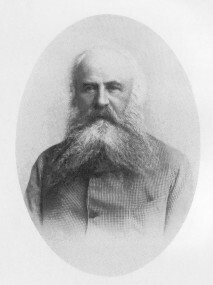 No proper citation has yet been found, but it can at least be added here that page 48 of the Chess Player’s Chronicle, 11 July 1883 quoted as follows from a recent issue of the Jewish Chronicle: ‘And yet Mendelssohn said, “For a game, it is too serious, for study, it is too much like play”.’ The context implied, though no more than that, that Moses Mendelssohn was being referred to, and it is the only instance we have found so far of any such quotation in a pre-twentieth-century source. Mr O’Keefe has provided all five games involving Tolstoy’s son which were published in Novoe Vremia. The first and third ones were mentioned in C.N. 3667 as being available in databases. 1 d4 d5 2 c4 dxc4 3 Nf3 Nf6 4 e3 Bg4 5 Bxc4 e6 6 Qb3 Bxf3 7 gxf3 b6 8 Rg1 c6 9 Nc3 b5 10 Be2 a5 11 Bd2 g6 12 Rc1 a4 13 Qc2 Nd5 14 Nxd5 exd5 15 e4 Bg7 16 e5 O-O 17 Bd3 Qe7 18 a3 Bxe5 19 dxe5 Qxe5+ 20 Kf1 Qxh2 21 Bxg6 Qh3+ 22 Ke2 Qe6+ 23 Be4+ Kh8 24 Qc3+ f6 25 Bh6 Rf7 26 Rg4 Nd7 27 Rcg1 Ne5 28 Qa5 Rfa7 29 Rg8+ Rxg8 30 Qxa7 Ng6 31 Rg4 dxe4 32 Rxe4 Ne5 33 Qd4 Nxf3 34 Kxf3 Qh3+ 35 Ke2 Qxh6 36 Re6 Qh5+ 37 Kd2 Qg5+ 38 Kc3 Qc1+ 39 Kd3 Qd1+ 40 White resigns. Source: Novoe Vremia, 21 September 1900, page 5. 1 e4 e5 2 Nf3 Nc6 3 c3 d5 4 Qa4 dxe4 5 Nxe5 Qd5 6 Nxc6 bxc6 7 Bc4 Qd7 8 O-O Nf6 9 d3 exd3 10 Bxd3 Be7 11 Bf5 Qd6 12 Bxc8 Rxc8 13 h3 O-O 14 Qxa7 c5 15 Qa4 Ra8 16 Qc2 Qe6 17 b3 Nd5 18 Na3 Nxc3 19 Bb2 Ne2+ 20 Kh1 Nf4 21 Nc4 Rfd8 22 Ne5 Rd5 23 Qc4 Qf5 24 Ng4 Bd6 25 Qc3 Qg6 26 Qf3 Ra6 27 Rfe1 h5 28 Ne5 Qf5 29 g4 hxg4 30 hxg4 Qg5 31 Nc4 Bf8 32 Be5 Rh6+ 33 Kg1 Rxe5 34 Rxe5 Qh4 35 Rh5 Nxh5 36 gxh5 Rxh5 37 Re1 g6 38 Re5 Qh2+ 39 White resigns. Source: Novoe Vremia, 12 July 1901, page 5. 1 e4 e5 2 Nf3 Nc6 3 c3 d5 4 Qa4 f6 5 Bb5 Nge7 6 d3 Be6 7 O-O a6 8 Bxc6+ Nxc6 9 Be3 Be7 10 Nbd2 O-O 11 d4 dxe4 12 Nxe4 f5 13 Neg5 Bd5 14 dxe5 f4 15 Bxf4 h6 16 Nh3 b5 17 Qc2 Qd7 18 Qg6 Qe6 19 Qg3 Bxf3 20 Qxf3 Nxe5 21 Qg3 Nc4 22 b3 Nd6 23 Rfe1 Qf7 24 Qd3 Rad8 25 Qc2 Ne8 26 Bg3 Bd6 27 Re3 Bxg3 28 hxg3 Nf6 29 Rae1 Ng4 30 Re4 Rde8 31 f3 Nf6 32 Rxe8 Rxe8 33 Rxe8+ Qxe8 34 Nf4 Nh5 35 Ne2 Qe5 36 Kh2 c5 37 c4 b4 38 Qd2 a5 39 Kh3 Nf6 40 Nf4 Qe8 41 Qd6 Nd7 42 Qe6+ Qxe6+ 43 Nxe6 Kf7 44 Nf4 Ne5 45 Ne2 Kf6 46 f4 Nd7 47 g4 g5 48 g3 Nb6 49 Kg2 a4 50 Kf3 a3 51 Nc1 Ke6 52 Ke3 Kf6 53 Kd2 Ke6 54 Kc2 Ke7 55 Nd3 Nd7 56 Nf2 Kf7 57 Ne4 Kg6 58 Kd2 gxf4 59 gxf4 Kf7 60 Ke3 Resigns. Source: Novoe Vremia, 2 August 1901, page 4. 1 e4 e5 2 d4 exd4 3 Qxd4 Nc6 4 Qe3 Be7 5 Bd3 Nf6 6 Qg3 d5 7 e5 Ng4 8 Nf3 h5 9 h4 Bc5 10 O-O Be6 11 Bg5 Qd7 12 Nc3 Be7 13 Bf4 O-O-O 14 Rfe1 Nb4 15 Bb5 c6 16 Ba4 g6 17 a3 Na6 18 Nd4 Nc5 19 f3 Nh6 20 Bb3 Nxb3 21 cxb3 c5 22 Nxe6 Qxe6 23 Bxh6 Rxh6 24 f4 d4 25 Ne4 Rd5 26 b4 cxb4 27 Nd6+ Bxd6 28 f5 Qd7 29 Qg5 Rh8 30 exd6 Qxd6 31 axb4 Rxf5 32 Qe7 Qb6 33 Rac1+ Kb8 34 Qe8+ Qd8 35 Qxd8+ Rxd8 36 Re7 d3 37 Rcc7 Rb5 38 White resigns. Source: Novoe Vremia, 16 August 1901, page 5. 1 e4 e5 2 Nf3 Nc6 3 Bc4 Nf6 4 d4 exd4 5 Ng5 d5 6 exd5 Ne5 7 Qe2 Qe7 8 O-O h6 9 Nf3 Nxf3+ 10 Qxf3 Qc5 11 Qe2+ Qe7 12 Re1 Qxe2+ 13 Rxe2+ Kd8 14 Nd2 Bc5 15 Nb3 Bb6 16 h3 Re8 17 Rxe8+ Kxe8 18 Bf4 Bf5 19 Be5 Bxc2 20 Nxd4 Bg6 21 Nb5 Kd7 22 Nc3 Rd8 23 Na4 Kc8 24 Rc1 Ne8 25 Nxb6+ axb6 26 Bb3 f6 27 Bf4 Nd6 28 Rc3 Bf7 29 g4 Rd7 30 f3 Nb5 31 Rd3 c6 32 Be3 Bxd5 33 Bxd5 Rxd5 34 Rxd5 cxd5 35 Bxb6 Kd7 36 a4 Nd6 37 b4 Nf7 38 f4 Kc6 39 Bd4 Nd6 40 Kf2 g6 41 Ke3 f5 42 b5+ Kd7 43 Be5 fxg4 44 hxg4 h5 45 Bxd6 Kxd6 46 f5 d4+ 47 Kxd4 Resigns. Source: Novoe Vremia, 11 November 1902, page 5. 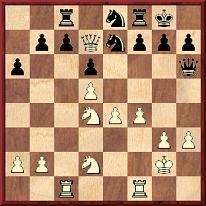 Solution: Dudeney showed that the task could be carried out in 18 moves. Numbering the board from 1 to 20 (i.e. with the black bishops on squares 1, 2, 3 and 4 and the white bishops on squares 17, 18, 19 and 20), he gave the solution as: 1 18-15 3-6; 2 17-8 4-13; 3 19-14 2-7; 4 15-5 6-16; 5 8-3 13-18; 6 14-9 7-12; 7 5-10 16-11; 8 9-19 12-2; 9 10-4 11-17; 10 20-10 1-11; 11 3-9 18-12; 12 10-13 11-8; 13 19-16 2-5; 14 16-1 5-20; 15 9-6 12-15; 16 13-7 8-14; 17 6-3 15-18; 18 7-2 14-19. 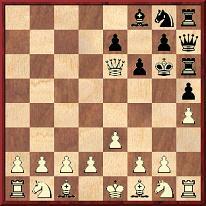 Solution: The queens are placed on d3, e4, c5 and h8. 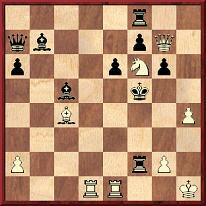 Solution: The first two moves for White must be 1 e4 and 2 Qg4. 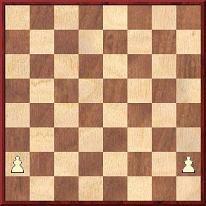 ‘Starting from the ordinary arrangement of the pieces as for a game, what is the smallest possible number of moves necessary in order to arrive at the following position? All six problems were taken from Amusements in Mathematics by H.E. Dudeney (London, 1917). 1 d4 e5 2 Qd3 Qh4 3 Qg3 Bb4+ 4 Nd2 a5 5 a4 d6 6 h3 Be6 7 Ra3 f5 8 Qh2 c5 9 Rg3 Bb3 10 c4 f4 11 f3 e4 12 d5 e3. 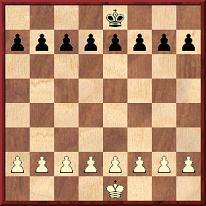 And White is stalemated. It is Loyd’s name which is most commonly associated with the 12-move stalemate game, in the following version: 1 d4 d6 2 Qd2 e5 3 a4 e4 4 Qf4 f5 5 h3 Be7 6 Qh2 Be6 7 Ra3 c5 8 Rg3 Qa5+ 9 Nd2 Bh4 10 f3 Bb3 11 d5 e3 12 c4 f4. See, for instance, page 207 of The Puzzle King by S. Pickard (Dallas, 1996), the source being stipulated on page 237 as ‘1906, Lasker’s Chess Magazine’. Above his diagram of the final position Dawson gave ‘G.R. Reichelm [sic], Solved by C.H. Wheeler. Brentano, Jan. 1882’. We add the exact reference for the task, on page 455 of the January 1882 issue of Brentano’s Chess Monthly: it was one of 18 ‘nuts’ set by Reichhelm and read, ‘Play so that White can get stalemated in 16 moves without losing a man’. Can a reader send us any of the other, slightly longer solutions referred to by Dawson? 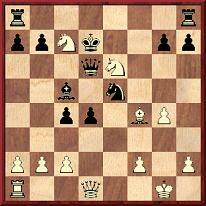 v) Soltis omitted the move which brought about the stalemate, i.e. 12...f4. This leg-pull was discussed by W.H. 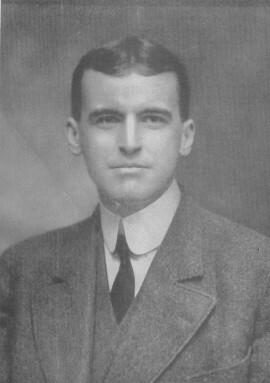 Watts on page 259 of the July 1914 BCM , with reference made to Loyd and Lasker’s Chess Magazine. Loyd’s spoof article (i.e. 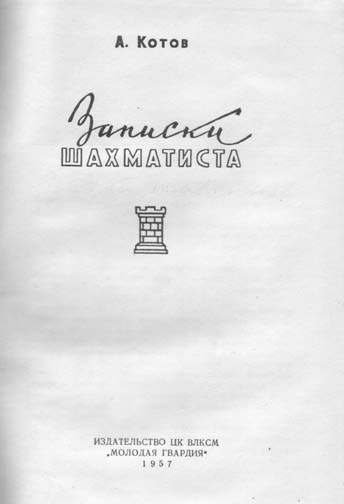 with the 1 d4 d6 version of the game) was plagiarized in an unsigned article entitled ‘Justicia Reglamentaria’ on pages 157-158 of El Ajedrez Americano, October 1935. The players in the parody were named as Jesús Fernández and Ramón Pérez. 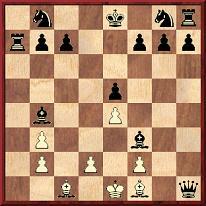 ‘In how few moves, from the start-of-game position, can stalemate come about? Sam Loyd worked out a train of 12 moves, producing a position which has become world famous. 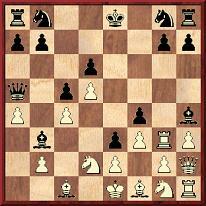 L.A. Edelstein of Oxford University has found a new solution in 11 moves only, totally different from Loyd’s. Then CHESS gave the famous ten-move Loyd game with captures, from Le Sphinx of October 1866 (see, for instance, page 58 of A.C. White’s book on Loyd): 1 e3 a5 2 Qh5 Ra6 3 Qxa5 h5 4 Qxc7 Rah6 5 h4 f6 6 Qxd7+ Kf7 7 Qxb7 Qd3 8 Qxb8 Qh7 9 Qxc8 Kg6 10 Qe6 Stalemate. CHESS added that a number of readers, including Edelstein himself, had found that his own final position ‘can be reached in ten moves instead of 12!’ [sic – ten moves instead of 11], one possibility being 1 h4 e5 2 c4 d5 3 Qb3 dxc4 4 e4 cxb3 5 axb3 Qxh4 6 Ra4 Qxh1 7 g4 Bxg4 8 Nf3 Bxf3 9 Na3 Bxa3 10 Rb4 Bxb4 Stalemate. Finally here, as regards the first discovery of the 12-move game without captures, it will be noted that when H.E. 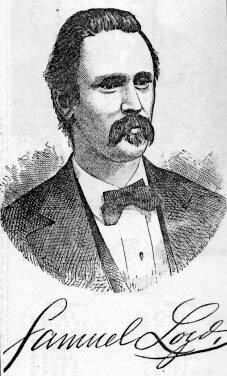 Dudeney and A.C. White named four persons they omitted the real discoverer, C.H. 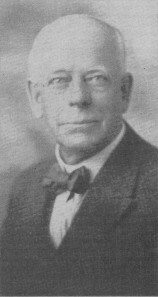 Wheeler (1846-1927). It must be hoped that justice will, at long last, be done to Wheeler (who was, according to W.A. Shinkman on page 210 of the December 1927 American Chess Bulletin, ‘exceedingly modest of his own powers’) for being the real inventor of 1 a4 c5 2 d4 d6 3 Qd2 e5 4 Qf4 e4 5 h3 Be7 6 Qh2 Bh4 7 Ra3 Be6 8 Rg3 Bb3 9 Nd2 Qa5 10 d5 e3 11 c4 f5 12 f3 f4, as published in Sunny South in 1887.